Scam: Pressing #-9-0 on your telephone will allow scammers to make long-distance calls and charge them to your phone bill. A well known telephone scam is now being used on cellular telephones. A scam artist places a call to an unsuspecting person and the caller says he or she is testing mobile (cellular) telephone circuits or equipment. The called party is asked to press #90 or #09. If this happens END THE CALL IMMEDIATELY with out pressing the numbers. 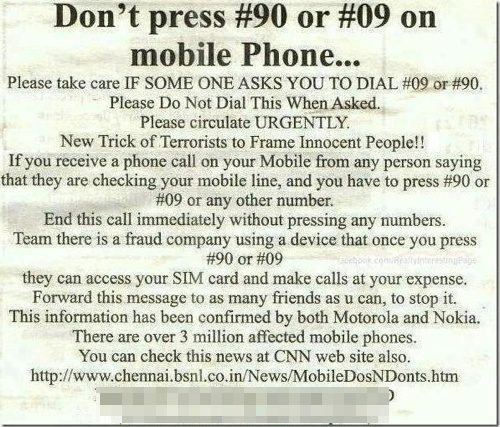 Once you press #90 or #09 the company can access your SIM Card and makes calls at your expense. If you receive a text message on your mobile from the number 15477 Indicating that you have won a 2 night stay in the Druid’s Marriott in Wicklow, saying that they you must reply with the text “#90” or “#09”, You Should delete this text immediately and not reply. This is a fraud Company using a device, that once you press #90 or #09 and reply text, they can Access your “SIM” card and make calls at your expense. Forward this message to as many friends as you can to stop it. Please note the following if you are using the mobile. If you receive a phone call on your mobile from any person, saying that, he or she is a company engineer, or telling that they’re checking your mobile line, and you have to press # 90 or #09 or any other number. End this call immediately without pressing any numbers. There is a fraud company using a device that once you press #90 or #09 they can access your “SIM” card and make calls at your expense. Forward this message to as many friends as you can, to stop it. it, only a very small, specialized portion of the phone-using public is now vulnerable to the scam described therein. (i.e., ones for which pressing ‘9’ is the signal to obtain an outside line, and there are no restrictions placed on outgoing calls), a scammer could gain access to place expensive, long-distance phone calls by tricking an employee into initiating the #-9-0 sequence. Outside of a few other settings where one might have to press ‘9’ to obtain an outside line (such as hotels), the likely result of pressing #-9-0 will simply be a fast busy signal. Businesses using PBX lines can ask their vendors to disallow call transfers to 90# and 900#. Instruct telephone operators and employees to beware of requests for transfers to 900 or 800 extensions. Train employees not to transfer anyone, ever, to an outside line.